Imagine a nine-story building collapsing in seconds and reduced to a height of only three story with three to five thousand people inside. 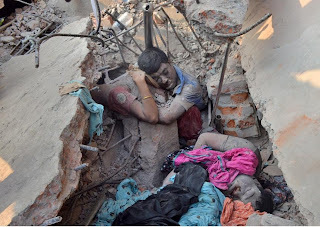 Thats what happened here when a nine-story building with mostly garment manufacturers collapsed in Savar, in the outskirts of capital city Dhaka which killed more than 300 people so far (the number is increasing by every hour as new bodies are discovered) and injured more than two thousands. 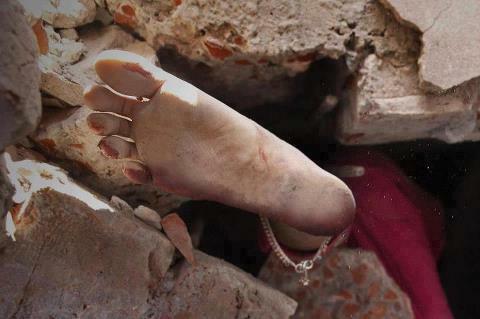 close to five hundreds are believed to be still trapped under the rubble. 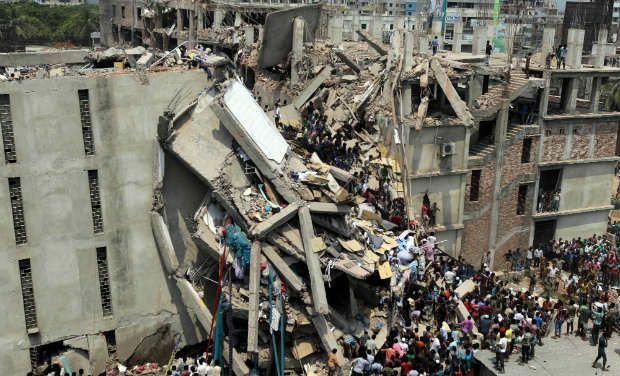 Six garment manufacturers were operating from the third to the eight floor of the structure in Savar and at least five thousand people were inside the crowded building when it caved in on the morning of April 24, 2013. The building collapsed at around 9am soon after the workers began their work in the factories, a big crack appeared in the building’s structure on the Tuesday, making it extremely unsafe for use. The background of this tragedy is really infuriating the people of Bangladesh because this tragedy has everything to do with greed and carelessness. This was not an accident, but a death trap created by some people who are so filthy greedy that they forced these labours into work just the next day even after there was a clear sign that the building had massive crack on walls and it was inspected by some officials who recommended that the building be evacuated. The owner of the building as well as the owner of the garments factory housed in that building ignore and forced those poor soul to work in that dangerous building. It appeared through the investigation of the local news media that the owner of this building is a powerful local politician who grabbed the very land upon which this factory building was erected. He ignored all standard and the building was built with poor material and without following building code standards. There were corruption in the entire process of erecting this building and its use and sign of evading law in every turn. No only that, after the collapse the owner and local politician, who was also inside the building, escaped with the help of local Minister of Parliament. The police is still searching him, but many doubt the sincerity of the pursuit because of past examples how such political characters get invisible protection by the government and fail to come under the rule of law. As more investigation comes out of this tragedy the more we get to know how the lives of all those people were so carelessly ignored because more profit are to be made through cheap labors. Among all these news of tragedy one thing that emerged greatly is the fact that almost close to 3,000 people were rescued alive from under the rubble which itself is like a miracle. There were a number of factors that can be attributed to this miracle, but primarily it is the triumph of human spirit. The way common people along with the arm force and fire service personnel joined in hand and very bravely went inside this collapsed structure without fearing their own lives and painstakingly drilled hole to go from one floor to another is quite an impossible feat. May God bless the soul of those which we lost in this tragedy and give speedy recovery to all who survived. For this particular tragedy We from Porshee Foundation is partnering with Sneha Foundation to help with short term and long term help of the victims and their family. After the recovery phase all the families will need immediate help and Sneha Foundation is working towards that which we hope to also support in our small capacity as well. Surrounding this tragedy and the fact that it was our excessive greed on part of few individuals, a friend of mine shared the following quotation by Dr. Paul Farmer, who said, "The idea that some lives matter less is the root of all that is wrong with the world." If you look at all the wars, man's exploitation of other human beings, the war for oil, gas and for control over territory - for each of which, if you dig deeply and clear all the lies, the same truth will emerge that it is the excessive greed, the infatuation and blindness of true reality which causes such sufferings. It is when the lower self of human being is allowed to have dominance, then greed and tendency to consider other lives less important can hijack conscience, ethics and morality. The incident of drone attack, indiscriminate killings of civilians, the wholesale ignoring of safety for the sake of cheap labour are all coming out of the same source of evil which was predicted by the wise souls in the past. The term that the Prophet used in the above saying, is hubb-e-dunya, which can be translated as Love of the Temporal World. The arabic word Dunya doesnt exactly translate well when said, "World." Maulana Rumi sums it up in one line, where he poses the question, and then answers it. He says, “What is dunya? It is to be unmindful of Allah.” Anything that makes you forget the Real is Dunya. According to Islamic scholars all things that appeal to the lower-self (nafs) and at the same time takes one's self way from God and God's reality, His Kingdom is Dunya. In the Christian tradition money is categorically called the source of all evil. Money is one of the subset of Dunya, most people are made blind because of wealth, money. But there are some who are blinded by other things such as pride, power, flesh etc. All of these sources collectively are called Dunya. Dunya is the intentional and voluntary adoption of anything evil which causes one to become forgetful of Allah irrespective of what that thing may be. The acquisition of wealth and other material means is not evil, but Hubb-e-dunya (love for such material objects) is evil and not only that, it is the source of all evil. Wealth is like the water in the ocean and the heart of man is like the ship sailing in the ocean. Water, while it facilitates the movement of the ship can also bring about its sinking. As long as the water remains outside the ship, it aids its sailing. But entry of the water into the ship causes it to sink. Similar is the case of wealth. Wealth aids man as long as it remains outside his heart. However, of its love enters the heart it will bring about his destruction. If you look at the political elites, if you look at those who are responsible for wars - you will find that it is money and profit making which is behind all of it. Many first world countries now a days because of economic pressure think that only if they can go to another war they could sell more of their weapons, their industrial complex will keep rolling and they could show that more jobs were added to the economy though they will never say that those news jobs were about manufacturing new bullets and automatic weapens to be used in Civil wars in Africa or to supply to create more deaths in Iraq, Afghanistan or Syria. The intelligent ones thus say: 'The dunya (or the world) is like a serpent whose skin is colourful and most beautiful. But its poison is fatal. Intelligent people maintain a distance from such danger and are not lured by the externally adorned skin. But a little child unaware of the danger of a snake is attracted by the external beauty and is prepared to grab hold of the snake. We are comparable to the little child. We are attracted to the world by its external beauty and adornment without being aware of its dangers. Men of intelligence and experience do not incline towards the world. What is the Remedy against such Evil? First of all one needs to acknowledge in heart the reason of creation. God the Creator created everything for human beings and He created human beings for Himself. What it means that we were created for Him? It means we are created so that we may understand our divine nature and divine purpose. So that we may come to recognize the divine spark that is within us, that we carry God's breathe within and our highest success in this world is to come to recognize Him through His Signs. We are created so that we may recognize Him and to work righteously, to do good to others. So that we may adore the Adorable, we may obey the One Who deserves to be Obeyed as Lord and Creator. There is death and it is only awakening to the eternal after life. We come from God, and we return to Him and the Great Reality shall again resurrect us before the Day of Final Accounting. He is the True Judge Who Judges without a single injustice. In the end all souls must return to the Supreme Soul and will be awakened once again to Awesome Reality where the Authority shall be entirely God's. When His Kingdom comes, it is only Him Who manifest as King with full authority and no worldly identity benefits anyone. All shall stand before him naked with nothing to prove except one's entire life and all the deeds. The Grand Accountability in front of God is real and those who forget this are those who are most deceived by the Arch-Deceiver who makes them think they can do whatever they want, they can profit at any cost, they can kill as many lives as they want and nothing will happen to them. Let them wait till they awaken in the Real Awakening after death. The Islamic scholars say that the best remedy against infatuation and blinding attachment to the world is to remember the most certain thing in life, that is death. Remembering death abundantly helps understand the temporality of this world. The wise ones say, 'Remember maut (death) in abundance and do not involve yourself in distant and remote hopes. The pursuit of distant schemes and material enterprises should be shunned. In this way the love of the world will be eliminated from the heart. This elimination is in fact the stage at the end of Sulook (the Path along which the spiritual traveller travels in his spiritual journey). One has, in fact, to become imbued with the spirit and quality spoken of in the following tradition of Islam, "Die before your death." This tradition means that one has to inculcate the attribute of the dead in one even before death, and that attribute is the lack of worldly love. There are three ways by which one can attain proximity with Allah Ta'ala, These are explained in detail as follows. Aqall wa Aqrab (the shortest and nearest way). This consists of observing in abundance Sawm (Fasting), Salaat (Prayer), Qiraa’at (Reading of Scripture), Hajj (Pilgrimage), Jihaad (Spiritual struggle for just cause and against lower inclinations), etc. This is the way of a class of Auliyaa (Friends of God, Saints) known as the Akh’yaar. In addition to the above acts of worship is engagement in Mujaahidah, Riyaadhat, elimination of Akhlaaq-e-Zameemah and the acquisition of Akhlaaq-e-Hameedah. The majority of men traveling along the Path of Sulook become Waasil (attain the goal of Divine Proximity) via this second way. This is the way of Ishq (Love). Riyaadhat (spiritual exercises) and mingling with people are suffocating to the Saalik (spiritual traveller) along this path. Zikr, Fikr, Shukr and Shauq are the intellectual occupations of the traveller plodding along the Path of Ishq. The traveller along this Road become Waasil by this method. Purification of the nafs and adornment of the heart and soul are realized by the method of Love. They have no interest in kashf (inspirational revelation of the Auliyaa) and karaamat (miracles of the Auliyaa). They are totally immersed in: "Die before your death." This third way is the way of the class of Auliyaa known as the Shataariyah. Taubah (repentance), zuhd, (abstention), Qanaa’at (contentment), tawakkul (trust in Allah), Azlat (solitude), Tawajju I’lallaah (attention directed to Allah Ta'ala), sabr (patience), Ridhaa (pleased with Allah), Zikr (remembrance of Allah) and muraaqabah (meditation). Among the Shataariyah the salient feature is Muraaqabah. One has to inculcate the above qualities which overtake a dying person to a high degree. Taubah, i.e. repentance to emerge from all evil as is the position at the time of maut; Zuhd, i.e. to shun the world and everything in it as is the case at maut; Tawakkul, i.e. to shun all abnormal worldly agencies as is the case at maut; Azlat, i.e. to sever all ties with creation as is the case at maut; Qanaa'at, i.e. abstention from lowly desires-- to be contented-as is the case at maut; Tawajju I’lallaah, i.e. to rivet one's attention towards only Allah Ta'ala as is the case at maut; Sabr, i.e. to shun pleasures as is the case at maut; Ridhaa, i.e. to abstain from pleasing the nafs, and to be pleased with Allah and to submit in entirety to Allah Ta'ala as is the case at maut. This is the conception of "Die before your death." One has to transform one's condition so as to be imbued with the conception of "death before death". In this earthly life, the body is on earth, but the rooh should be directed to the Aakhirah, and be in communion with Allah Ta'ala. Possession of even the kingdom of the earth should not affect one's heart. The heart at all times should be empty of the world. The sign of this lofty state having settled over one is total abstention from everything branded as evil by the Shari'ah. The mind, tongue and the whole body have to be sealed from evil. The heart is to be emptied of all things other than Allah Ta'ala. It has to be adorned with Akhlaaq-e-Hameedah. A man dwelling in this lofty state of purity and communion with Allah Ta'ala is always aloof from gatherings of futility. Whatever diverts the mind of the Seeker of Allah from the remembrance of Allah is futility and nonsensical. The Seeker refrains from association with men of Baatil (falsehood and corruption). One who does not pursue the Path in quest of Allah, is in fact a man of Baatil (falsehood). 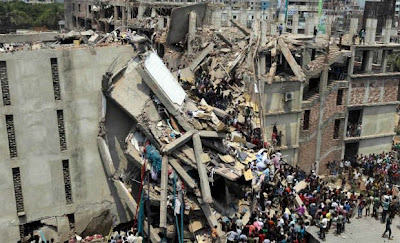 * Bangladesh factory collapse: Who really pays for our cheap clothes?